Firstly let Nicola and I (The Whisky Boys) wish all our readers a dramtastic 2019. 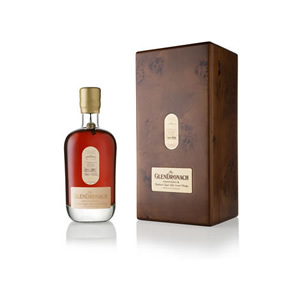 This Whisky bottled as The GlenDronach ‘Grandeur’ has been specially selected by Master Blender, Rachel Barrie, from some of GlenDronach’s oldest and most unique sherry casks. A selection of barrels, hogsheads, puncheons and butts have been maturing in traditional dunnage warehouses since the 1960s, and it is the most extraordinary and remarkable of sherry casks that have been chosen for this very special bottling of twenty-seven-year-old whisky. In 1826 the exuberant and extroverted James Allardice founded this distillery and produced his ‘Guid GlenDronach’ single malt. Originally, all of the workers at GlenDronach lived on site, including the distillery manager, staff, excise man, brewer and all of their families. To this day many of the old houses still remain. Now let’s have a wee taste of this old dram. Nose…From the outset sublime aromas entwined in a concoction of treacle, dried orange skin, cherries, chocolate fudge and a sweet berry fruit cocktail, my nose has just arrived in Whisky heaven. Taste…Very rich and full of sherried raisins, it then continued with chewy and rich fruit with a hint of cinnamon and ginger, dates and prunes, milk chocolate melting on a charred barrel stave in the sun. Finish…Long and ultra sweet, sweet berries are now lingering, I can now sit back and let the finish take me to joyous places, a fabulous delight. Rachel, once again you have delivered an outstanding dram. Now that is a wee bit rich for the Whisky Boys cabinet, but, if you are in a bar and get a chance to taste this outstanding GlenDronach do not hesitate as you will not be dissapointed. So to Rachel and her team up there in GlenDronach a big well done from The Whisky Boys HQ.